In deregulated electricity markets, producers and consumers participate in auctions in forward and spot markets (‘sequential markets’) which determine the allocation of electricity production. This column asks whether financial traders should be allowed to participate in electricity markets to arbitrage a price difference between forward and spot markets. Creating a sequential market is likely to improve market efficiency and consumer welfare, and arbitrage by financial traders is likely to benefit consumers by lowering electricity prices, but from a social planner's point of view, arbitrage does not necessarily improve market efficiency. A variety of economic goods (such as treasury bonds, stocks, coal, electricity, natural gas, oil, and agricultural products) are traded through sequential markets – their corresponding forward and spot markets. The rationale behind establishing sequential markets comes from simple economic theory. For a commodity with uncertainty in its delivery price or quantity, sequential markets can improve the efficiency of the final allocation. In an oligopolistic setting, sequential markets can also help reduce the extent of market power and improve efficiency (Allaz and Vila 1993). An example of sequential markets is deregulated wholesale electricity markets. Figure 1 shows the market structure of the Iberian electricity market, which we study in a recent paper (Ito and Reguant 2016). Electricity producers (e.g. thermal power plants) and consumers (e.g. retail electricity providers) first bid in the day-ahead market. The day-ahead market clears the bids, and generators are scheduled to produce electricity according to the outcomes of the day-ahead market. Then, firms can update their scheduled production quantities by selling or buying in several intra-day markets. 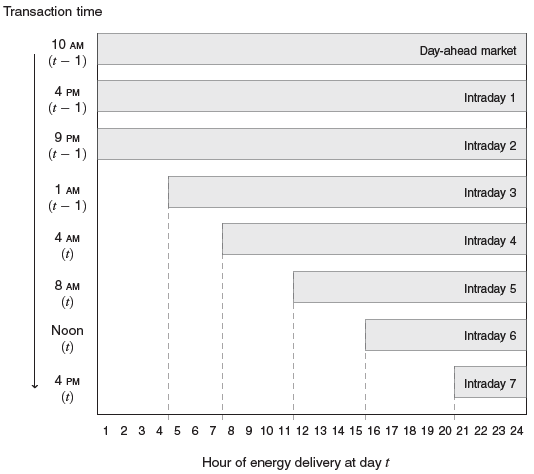 For example, for electricity delivery for hour 21, firms have seven intra-day markets to update their positions. In a stylised setting, prices in sequential markets should converge in expectation (Weber 1981). This is because if there exists a price premium, firms have the incentive to arbitrage to make profit. Therefore, we should observe no systematic difference in prices between the day-ahead and intraday markets on average. Empirical evidence, however, is usually inconsistent with this simple economic theory, with prices in sequential markets often exhibiting systematic price differences. In Figure 2, we use hourly data from 2010 to 2012 to show each market's average price by hour. Indeed, we observe a systematic ‘day-ahead price premium’ in the Iberian electricity market. 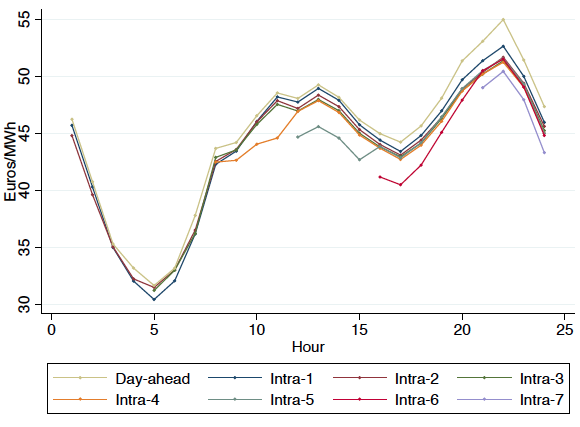 We develop a theory to help understand why we observe a day-ahead price premium in the Iberian electricity market as well as many other electricity markets. The intuition of our theory results is as follows. First, in most electricity markets, all demand has to be cleared in the day-ahead markets, and then intra-day markets reshuffle some of the demand. Second, most electricity markets are not perfectly competitive, with a few dominant firms exercising market power. This creates an incentive for dominant firms to act as a price-discriminating residual monopolist that withholds some production in a forward market. Our theory shows that this effect creates a systematic day-ahead price premium. Third, this price premium cannot be fully arbitraged because financial traders are not allowed to participate in the market, and arbitrage by existing market participants are constrained for several reasons. We empirically show that data support the conjectures of our theory. Market power and limited arbitrage are key factors to drive the day-ahead price premium. Does any player arbitrage the price premium? As long as there exists a price premium, there is an incentive for market participants to arbitrage. Even though financial traders (virtual bidders) are not allowed to participate in the Iberian electricity market, some sellers and buyers of electricity might arbitrage. In our paper, we show theories and empirics about who is more likely to engage in such arbitrage. First, wind farms have some technological advantages that make them quite attractive to arbitrage. They almost never use their maximum capacity because wind does not blow all the time. This means that they have greater abilities to sell electricity short in a lower-priced market. Second, wind generation faces substantial uncertainty in their expected wind. Therefore, these units have limited control on their final output, requiring them to update their reports. This means that participation costs in arbitrage might be smaller. Indeed, we empirically find that some wind farms most strongly engage in arbitrage, although they arbitrage only part of the price premium. Second, we show a theory that wind farms that produce less electricity in the market have a stronger incentive to arbitrage. Conversely, wind farms selling a lot of electricity have a weaker incentive to arbitrage, and they could even have an incentive to withhold (i.e. the opposite of arbitrage) if they sell substantial amount of electricity in the market. This is because firms selling electricity in the market benefit from higher forward prices, which weakens their incentive to arbitrage and lower forward prices. Our empirical findings confirm these theoretical predictions. Does full arbitrage always improve welfare? One of the key ongoing policy discussions is whether financial traders should be allowed to participate in electricity markets to arbitrage price differences between forward and spot markets. Does allowing arbitrage benefit consumers? Does it improve market efficiency? We develop a structural model of oligopolistic firms in sequential markets with the aim of providing evidence for these questions. Table 1 shows the results. We define the first-best as the outcome from a perfectly competitive market. We then compare this benchmark result to a few counterfactual situations. First, we consider the case where there is no sequential market (i.e. there is only a spot market). The deadweight loss is the largest for this scenario, implying that the market would be most inefficient. Second, we introduce a forward market but assume no arbitrage (this is the result in "no arbitrage" in the table). We observe that the introduction of a forward market significantly reduces deadweight loss. This is an empirical quantification of the theory developed by Allaz and Vila (1993). Third, we find that introducing arbitrage decreases consumer cost but increases deadweight loss, compared to a sequential market with no arbitrage. Consumers benefit from arbitrage because it lowers the day-ahead price. However, arbitrage increases deadweight loss because dominant firms that have market power produce even less when forward and spot markets prices converge due to arbitrage. Our results have important implications for the ongoing policy discussion regarding forward and spot markets in electricity markets. First, creating a sequential market is likely to improve market efficiency and consumer welfare through Allaz and Villa’s effect. Second, arbitrage by financial traders is likely to benefit consumers by lowering electricity prices. However, from a social planner's point of view, arbitrage does not necessarily improve market efficiency. This point is policy-relevant and timely in the context of electricity markets in the US and other countries. Regulators are considering introducing financial traders (sometimes also called virtual bidders) to “improve the efficiency of market.” However, one should be wary when evaluating the success of such policies. Our results imply that price convergence in itself is not a sufficient statistic for market efficiency. Under full price convergence, prices are not at their competitive efficient level. This cautionary tale should be considered when regulators allow arbitrage in a sequential market in which market power is present, which is usually the case for most electricity markets. Allaz, B, and J-L Vila (1993), “Cournot Competition, Forward Markets and Efficiency.” Journal of Economic Theory 59 (1): 1–16. Ito, K and M Reguant (2016), "Sequential Markets, Market Power, and Arbitrage ." American Economic Review, 106(7): 1921-57.